Do you have a few missing teeth that need to be replaced? Have you looked at your choices for tooth replacement and decided on dental implants? Are you wondering about the process and need more details? 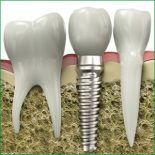 Do you understand how dental implants work and what to expect afterwards? The dental implant procedure takes some time and requires commitment – but it’s worth it. Here is what to expect. The preparation is as important as the procedure itself, so don’t be surprised when Santa Monica dentist Dr. Ana Brightleaf schedules a comprehensive dental exam to check your jawbone and surrounding gums to make sure they are in optimum health and able to receive dental implants. A thorough evaluation of your medical history is also necessary to make sure you don’t have health issues that would interfere with the healing process. This is a good time to discuss any medical conditions or medications you are currently taking. After your examination, a personalized treatment plan is determined based on your individual needs. This helps to give you a realistic picture of the entire process. Planned tooth removals are done first, followed by an appropriate time of healing. Then, a titanium post, which is the replacement root for your new tooth, is surgically placed into your jawbone. This is followed by several months of healing as the titanium post fuses with your jawbone. When the post is ready, it is crowned with your new artificial tooth. This tooth has to be carefully shaped and placed to make sure it fits properly into your natural bite. Once the work is complete, you’ll have a natural looking, naturally functioning tooth. Unlike removable teeth replacement options, such as dentures or bridges, dental implants are fused to your jawbone. They don’t need to be removed for cleaning, and they are a stable and permanent tooth replacement solution. Just like your own teeth, however, these teeth still require good oral hygiene. Additionally, you should avoid biting or chewing hard candy or ice as this can cause your new teeth to chip or crack. Contact Brightleaf Dental for a personal consultation today and find out if you are a good candidate for dental implants.